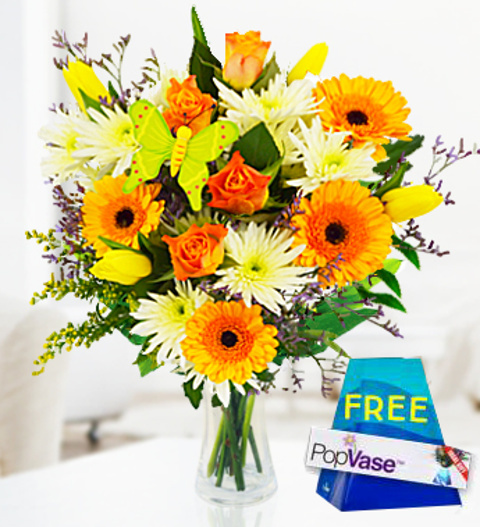 A cheerful bouquet presenting fresh Spring blossoms making this an exciting arrangement. Hand tied with warming Marie Clare roses, spring tulips, germinis and chrysanthemums - the arrangement is accented with dashes of limonium and solidago. To welcome the arrival of Spring the bouquet is finished with a colourful hand painted butterfly pick. Perfect for all occasions, the Spring Blossom bouquet comes with a FREE box of Belgian chocolates. Chocolates may contain nuts.